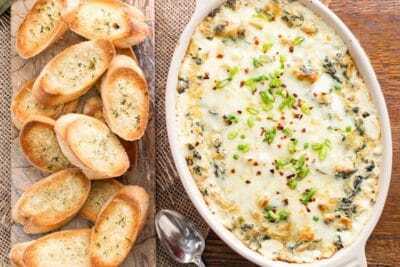 Hot Spinach and Artichoke Dip – Cheesy, creamy and loaded with chunks of artichoke hearts, earthy spinach, garlic and sweet onion. Serve with your favorite toasted baguette slices, crackers or chips for a memorable appetizer hearty enough to feed a hungry crowd – with easy make ahead directions too! This legendary hot dip has reached hero status over the years and it’s easy to understand why. It’s practically a classic and often referred to as the most popular appetizer of all time. It’s not surprising that you can find some variation of this dip on most restaurant menus. Some recipes include spinach and some do not. We say yes please to the spinach! Some popular recipes are blended until smooth, others are chunky like our version here. The artichokes are chopped but end up tender after being baked in all this cheesy goodness. If there’s one thing hard about this dip, it’s waiting until it cools enough to take a bite 🙂 Don’t be like me and burn the roof of your mouth. While it may be worth it in the moment, the few days following are not – haha. 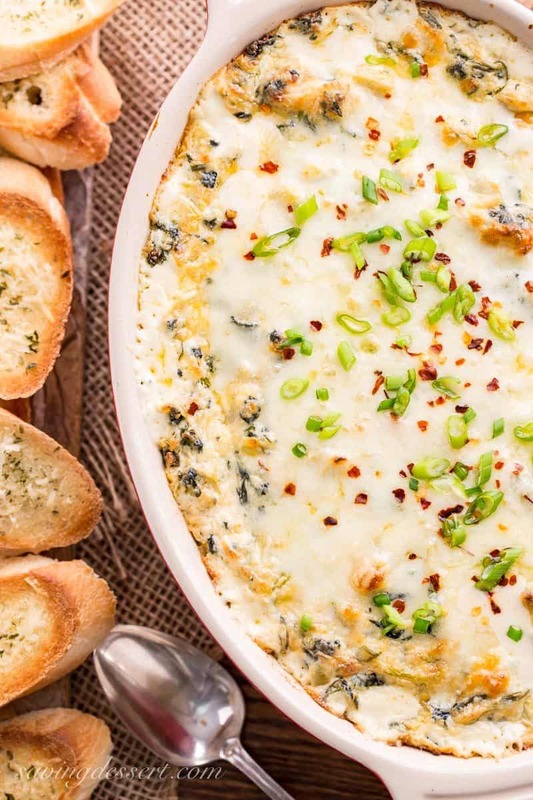 With easy make-ahead directions, our Hot Spinach and Artichoke Dip will be a welcome addition to your New Year’s Eve celebration, football party or even when you’re hanging around the house for the weekend. 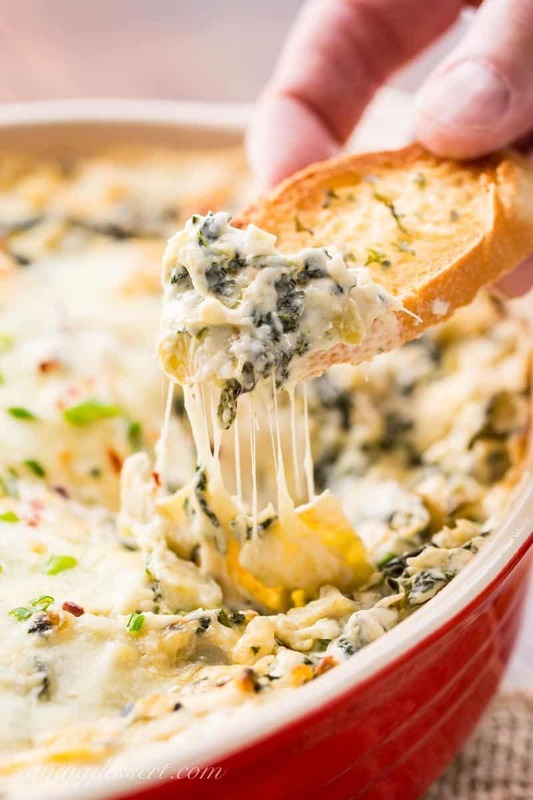 I bet this hot cheesy Spinach and Artichoke dip is the first to disappear from all your gatherings! Hot Spinach and Artichoke Dip leftovers are the best! You’ll to want to hide some of this amazing dip in the back of the refrigerator for leftovers. While it rewarms beautifully in the microwave for dipping, you can also create entire meals around this dip. Grab a few naan and some rotisserie chicken to make easy weeknight spinach and artichoke chicken pizzas. Have you ever tried this wonderful concoction on a grilled cheese sandwich? Oh yes, grilled cheese is a must! This dip is also incredible in Spinach Artichoke Stuffed Chicken like this gorgeous recipe from Cafe Delites. 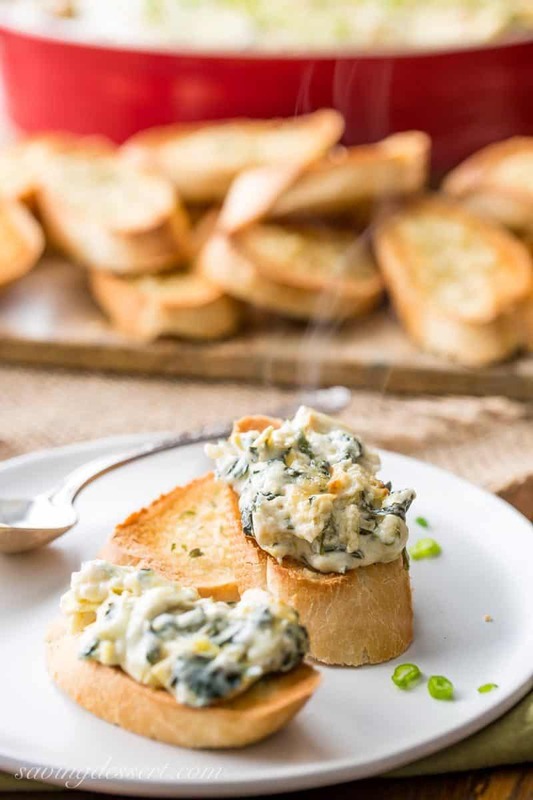 And finally, grab a loaf of Italian Bread, pull out some of the fluffy middle and fill it with this Hot Spinach and Artichoke Dip. Slice it up and serve! Check out this easy recipe for Cheesy Spinach Artichoke Bread from The View from Great Island. I love the extra spice that comes from the cayenne, hot sauce and red pepper flakes in our recipe. The dip is also delicious with a southwestern flare from chopped jalapeños or a can of diced green chiles too. If you can’t find frozen artichoke hearts, feel free to substitute canned, drained artichoke hearts. You may want to omit the salt in the recipe if the artichokes are stored in a brine. Be sure to taste before adding additional salt! We’d love to connect with you on social media. If you try our recipe, please use the hashtag #savingroomfordessert on INSTAGRAM so we can come give your post some love! And be sure to FOLLOW Saving Room for Dessert on FACEBOOK | INSTAGRAM| PINTEREST | TWITTER for all the latest recipes and updates. Melt the butter in a large oven-proof skillet over medium heat. Cook onion until softened, about 3 minutes. Add the garlic and cook until fragrant, about 30 seconds. Add the flour, stir to combine and cook for 3-5 minutes or until flour starts to turn a light golden brown. Slowly add the half-and-half and then the cream cheese chunks. Cook and stir until the sauce is slightly thickened. Remove from the heat and add the artichokes, 1 cup of the Parmesan, about 3/4ths of the mozzarella, lemon juice, hot sauce, cayenne, spinach and salt. Stir until well combined. Smooth the dip into an even layer in the skillet or scoop into a lightly greased casserole pan. Bake until golden brown and bubbling, about 20 minutes. Sprinkle with the remaining Parmesan, shredded mozzarella and the red pepper flakes. Return to the oven and bake an additional 10 minutes or until golden brown and bubbling. Cool for 10 minutes then serve with chips or bread. You can substitute 2 cans of artichoke hearts for the frozen. Be sure to omit the salt in this recipe and drain very well. 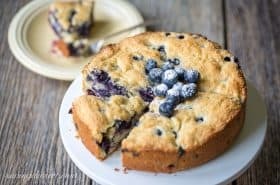 Make Ahead: Cover and refrigerate the mixture before baking for up to 24 hours. 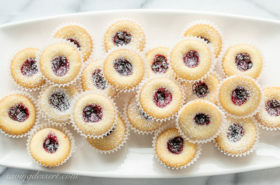 Allow the dip to sit at room temperature for 1 hour before baking. Cover with foil, bake for 10 minutes, then remove the foil and bake about 15 minutes (or until bubbly) then top with the remaining cheese and bake until golden brown and heated through, about 10 minutes longer. Store leftovers in the refrigerator. If you love hot bubbly dips as much as we do, don’t miss our family favorite Spicy Southwestern Spinach Dip. Another party favorite is our super easy to put together and delicious Buffalo Chicken Roll Ups Appetizers. We truly love party food! Join my free email list and get a FREE e-cookbook! Never miss a recipe - sign up today! Haha – oh yes, so easy to do Marcelle! One of my all-time favorites! This looks wonderful! Thanks Annie 🙂 It really is good stuff. Hope you had a wonderful holiday season! Happy New Year, Tricia! I’m late to the party, but this dip is fabulous 🙂 Hard to beat the classics when it comes to dips! Wow, Tricia, this festive dip looks fantastic. Your guests must have loved it. Happy New Year! Thanks Amalia – Happy New Year to you too! My mouth is watering! I wish I had the ingredients in the house…too cold to venture out to the store today 🙁 I would taste perfect on a frigid night! It’s cold here too Susan – and I wish I had a pan of this cheesy dip. Hope you enjoyed your holidays and Happy New Year! Between us I bet we could put the hurt on this dip Liz! Hope you and your beautiful family have a wonderful happy, healthy New Year! I love this dip, Tricia! My kind of food, I’d make a meal of it. Happy New Year! 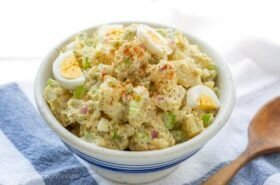 Yes indeed Pam – this makes a great party appetizer since it’s so filling and everybody loves it. Happy New Year to you and your family! Whenever I see a dip like this I can’t stop eating it. I love your version, pinned! A happy and healthy New Year to you and your family! Thanks Gerlinde! I wish you and your husband a wonderful happy New Year too! Believe it or not, I’ve never made this myself. That should be against the law at my age. Your version looks amazing Tricia. Happy New year! This dip needs to be on any celebration menu. Thanks Chris! Happy New Year to you too! Thank you Albert 🙂 Hope you have a very Happy New Year! This looks amazing! Love the pizza leftover idea too! Pinning! 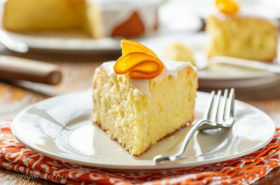 The recipe sounds great and the pics made me consider licking my screen. I love this stuff and like you think leftovers are good for many things like scrambled eggs. 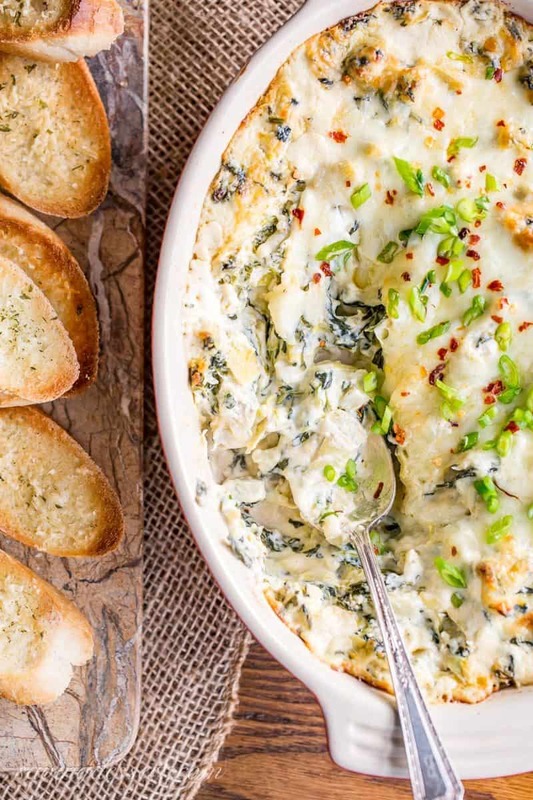 I could literally live on spinach and artichoke dip ~ this looks amazing Tricia! Thanks Sue – I feel the same way. Hope you and Grant have a very Happy New Year! This looks like perfection. Definitely sharing with friends for our New Year’s Eve party! Thanks so much Amy – enjoy and Happy New Year! Wish I could dig in right now! 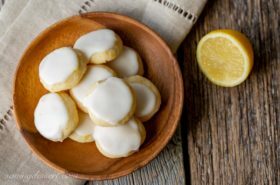 So good, so delicious! Thanks Angie – Happy New Year! Join my free email list and receive a free e-cookbook!